According to the American Psychological Association (2012), adopting effective strategies for change improves the likelihood of success (see What Americans Think of Willpower). Has someone ever approached you with a perplexing human drama or an all-consuming problem? Most of us have been present for friends, family, or even relative strangers who simply needed to talk about their experiences and wanted nothing more than for us to listen. The ICF core competency of active listening encompasses both what is and is not said. 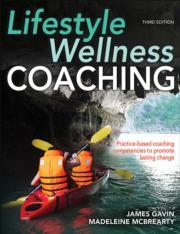 Lifestyle Wellness Coaching, Third Edition With Web Resource, offers an evidence-based and systematic coaching methodology that professionals can use to help clients achieve long-term overall wellness by addressing health, fitness, and lifestyle.